outdoor exploration and hands-on science. The Natural History Day Program provides the opportunity for middle school students to explore the Preserve's natural treasures and ecological concepts in an immersive, hands-on format. 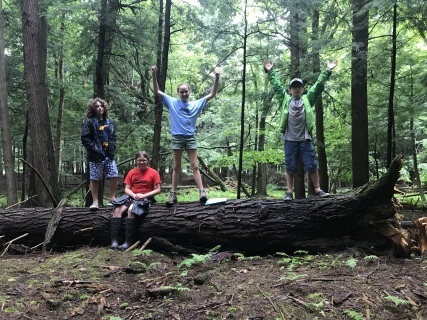 Students spend time hiking the Preserve's trails, exploring the ecosystems of the streams, lake, pond, and forests, problem solving, participating in group challenges and activities, and frequently end the day swimming at the lake. To apply online: apply online using our secure website and pay by adding the item to your cart to the right. ﻿To apply by mail﻿: download the application using the link at at the upper right of this page, or stop by the Preserve to obtain a printed copy of the application. Submit the completed application by mail or drop it off at the Preserve. Applications are not completed until payment is received. If the class fills, unpaid spots will be given to other children. Natural History Day Program is $225 for Preserve Members and $275 for Non-members. Programs can be paid for by check or cash in person at the Preserve, or by credit or debit card online. To pay for a program online, add the item to the right to your cart. Financial Assistance: No family should be discouraged from applying to the Natural History Day Program because of lack of funds. Please contact the Preserve office directly for information on scholarships. This item is for paying for one space for one child for the Natural History Day Program. Please be sure to include the STUDENT's name in the box in the options below. ​To receive the member rate, please contact the Preserve office at 518-797-3440 or info@huyckpreserve.org. To complete your child's registration you MUST complete the enrollment form, available on our website.